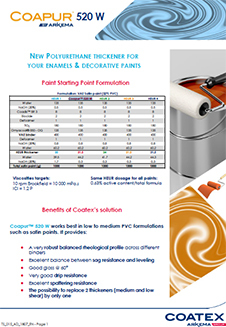 Coapur™ 520 W by Coatex is a water-soluble, non-ionic polyurethane thickener. 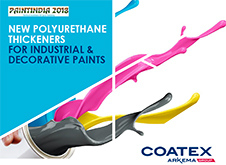 It is solvent- and alkyl phenol ethoxylate (APEO) free and designed for water-based coatings. It provides excellent coating properties due to its high associative effectiveness with every kind of binders particularly 0-VOC binders such as VAE. 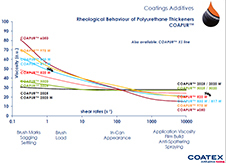 It can be used with other types of rheology modifiers such as acrylic or cellulosic thickeners. It helps increase viscosities at high shear rates and in a less extent low shear rate viscosities. Coapur™ 520 W is a cost-effective product, easy to handle due to its low viscosity and to its progressive thickening effect. It is highly effective in low to medium PVC formulations.